Mr. & Mrs. Obama WILLFULLY IGNORING AMERICA”S AFRICAN AMERICAN CHILD CARE HEALTH CRISIS! With all respect, how much evidence do Americans require before realizing Mr. Barack “My Brother’s Keeper” Obama is an emotionally ill American citizen who invites to his children’s and Nation’s home quite a few admitted or apparent emotionally ill American music recording artists and urban story-TRUTH-tellers who compose HATEFUL American art informing our world that American teen girls and women, aka the MATERNAL HALF of our population, should be viewed as less than human *itches and treated as *hores or “hoes” unworthy of basic human respect? I am referring to admitted or apparent emotionally ill repeat Obama White House guests and friends like Shawn ‘Jay Z’ Carter and Kendrick Lamar who compose and promote HATEFUL American music art vividly describing the “SUPER PREDATOR”, VIOLENT, SUICIDAL/HOMICIDAL people and community harming behaviors they engaged in or witnessed their emotionally ill family members, friends or community members engaging in. Nahziah Carter put the top high school recruit on a poster while Jay-Z watched. Regardless of their AGE, emotional, physical or MATERNAL condition, when Shawn Carter was in his teens he was peddling life scarring drugs to his depressed, self-harming neighbors. Glad to see at least one member of the Carter family is making a healthy future for himself that does not include harming other American citizens or creating American music art hatefully demeaning American teen girls and women, aka the MATERNAL HALF of our population, as less than human *itches and “hoes” undeserving of basic human respect. Americans promoting a Culture of Child Abuse! Source: Jay-Z Plans To Headline Ohio Concert In Support Of Hillary Clinton! Mrs. Hillary Clinton once characterized as Super Predators, children, teens and adults much like Shawn Jay Z Carter, born 1969, who during a critical period of their childhood/human development regularly experienced America’s current National HEALTH CRISIS, aka America’s Culture of African American Child Abuse, Emotional Neglect and Maltreatment that evolved from America’s long-standing, ignorant Culture of Racism. 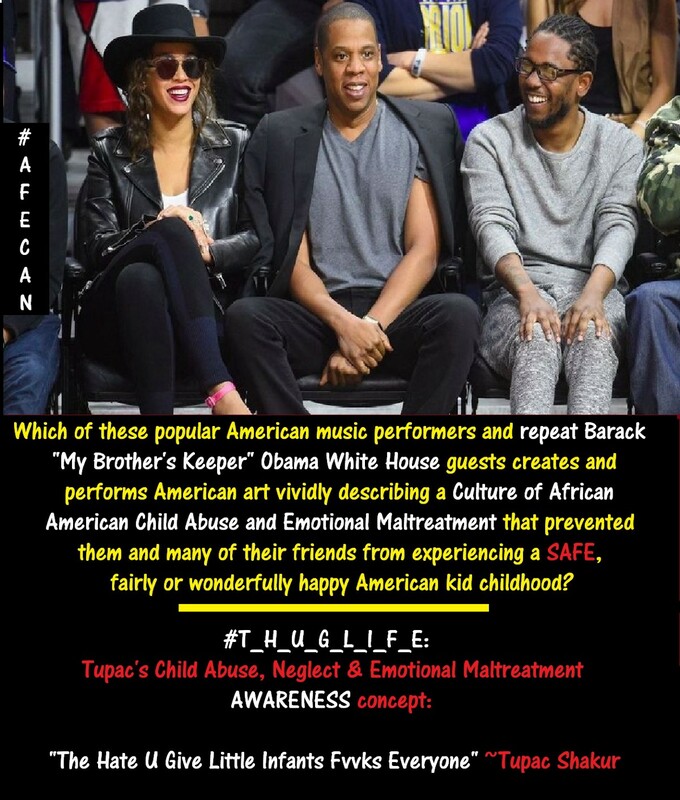 …put on a concert alerting young Americans to America’s Culture of Child Abuse, Emotional Neglect/Abandonment and Maltreatment that deprived him, as well as significant numbers of popular recording artists and urban storytellers, as well as untold numbers of American kids of African descent from experiencing a SAFE, fairly or wonderfully happy American kid childhood? Shawn Jay Z Carter, a popular American urban storyteller, recording artist, and THROUGH NO FAULT OF HIS OWN, a victim of America’s expanding social disorder and # ONE HEALTH DISEASE known as Childhood Trauma.